We're spending Christmas with my mother-in-law in the mountains of Northern California. When I walk around her 2-acre property, I often think of the kind of garden I would have if I lived here. Only a few of the succulents I grow in Davis would survive outdoors in this zone 6b/7a climate—others, including aloes, would not. What would do well are hardy sedums. They, ironically, languish in Davis (zone 9b). As a rule of thumb, the hardier a sedum is, the less heat it tolerates. That's why I've lost seemingly easy sedums like Sedum spurium and Sedum reflexum. They're hardy to zone 3 and zone 5 respectively and would turn into beautiful mats in my mother-in-law's garden. 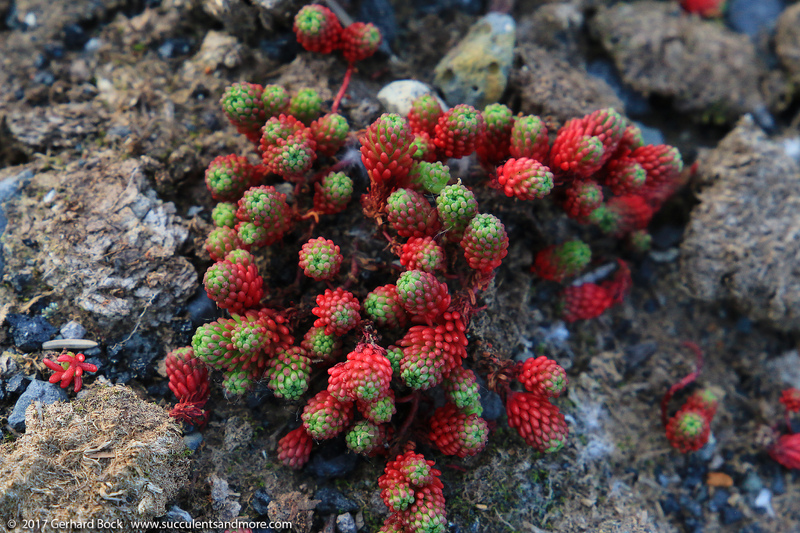 On our Iceland trip this summer, I visited Reykjavík Botanical Garden one evening. 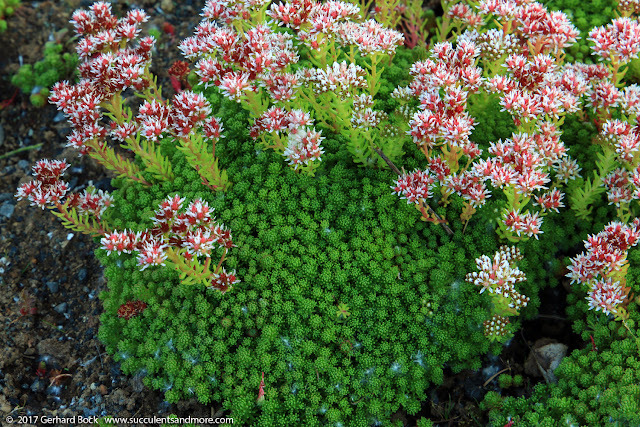 In addition to a wealth of alpine plants, most of them new to me, I also saw several sedums that were in full bloom. 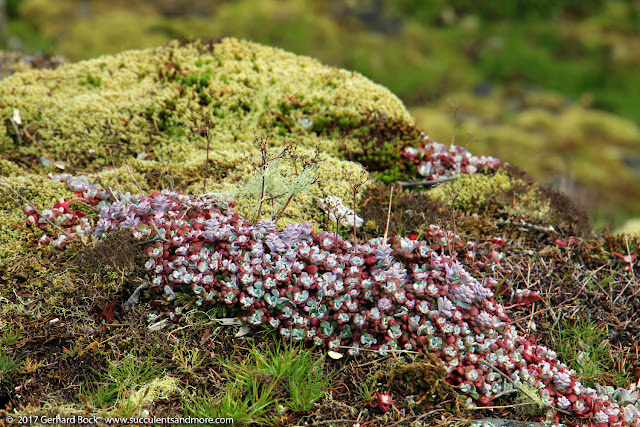 Typically I think of groundcovers as unassuming plants whose main role it is to hide bare dirt, but in Reykjavík these sedums—and companions like saxifrages—were the stars of the show. The labeling at the Reykjavík Botanical Garden was spotty, like it is at so many public gardens, so I wasn't able to identify all the plants that contributed to the floral tapestry. But the most spectacular sedum was Sedum lydium, or mossy stonecrop, native to the mountains of Turkey. It's hardy to zone 4 or 5, depending on which source you want to believe. 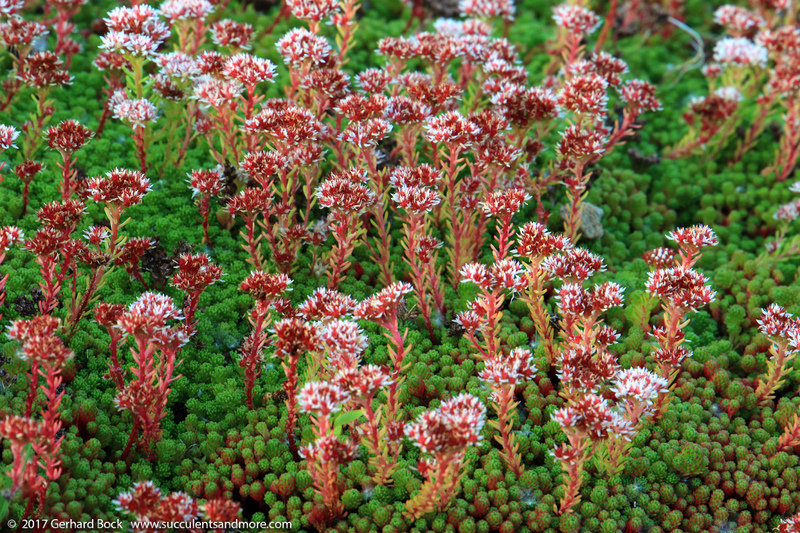 There were mats of Sedum lydium, with flower stalks looking like pink trees rising from a tundra of green. 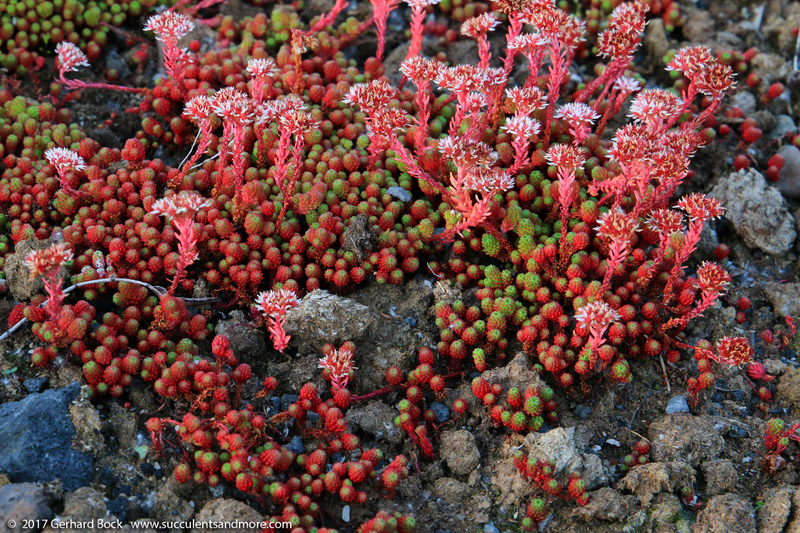 The plants that were getting the most sun were a deep red. I'm sure I let out an audible gasp when I saw them. Fortunately there was no one else around at 9:30 pm to hear me. 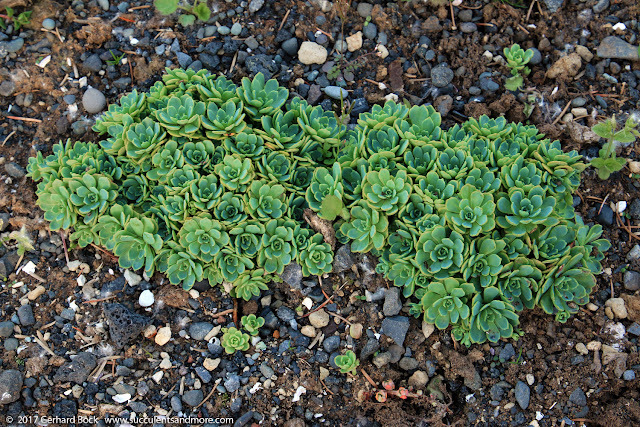 Sedum reflexum (below; zone 2-9) is quite common in nurseries in Northern California, sometimes labeled Sedum rupestre. Cultivars like 'Blue Spruce' (grayish blue like the photos below) and 'Angelina' (yellowish green) are said to do well in our climate. I've tried both, and they didn't live longer than a season. 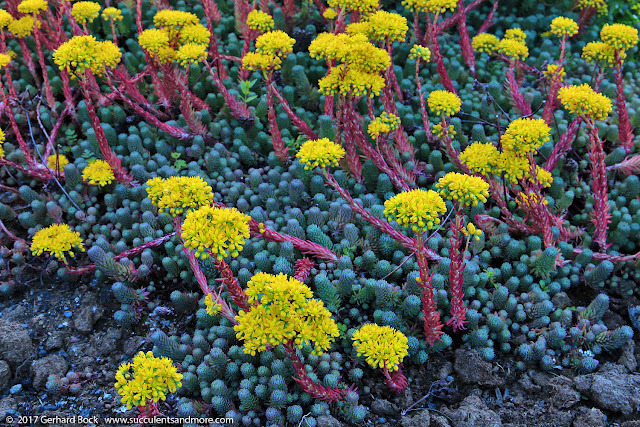 Sedum kamtschaticum (below; zone 2-9) has particularly attractive flowers. They start out deep yellow and then fade to little orange stars. I occasionally see a variegated form for sale in nurseries. I've tried this one, too, and didn't have much luck. 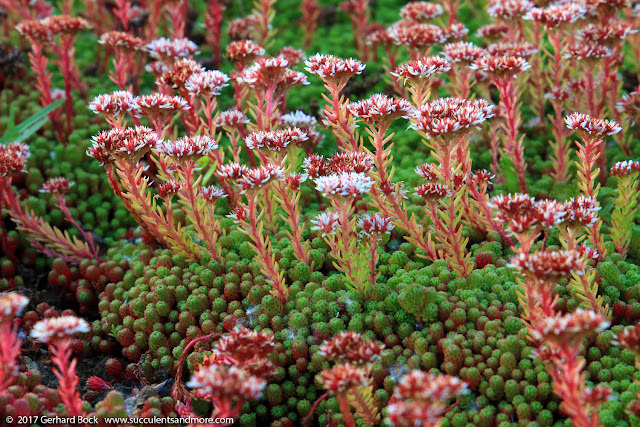 The next plant was growing between the sedums and fit in perfectly. 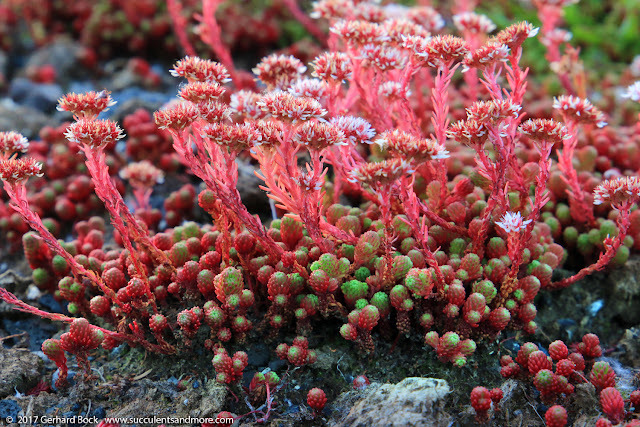 It turned out to be a saxifrage, Saxifraga × urbium (zone 4-9). 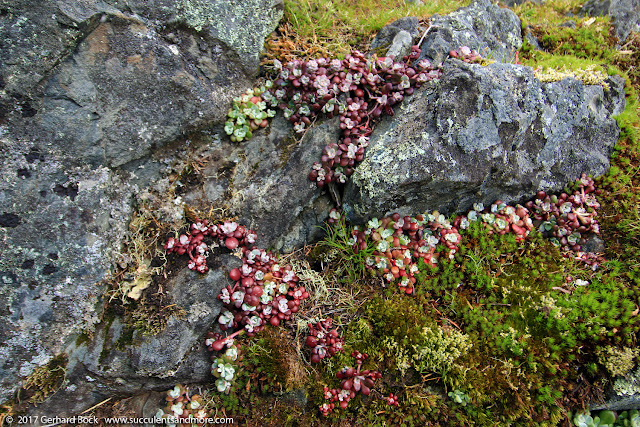 Saxifrages grow in Arctic-alpine ecosystems and are used to long, harsh winter. 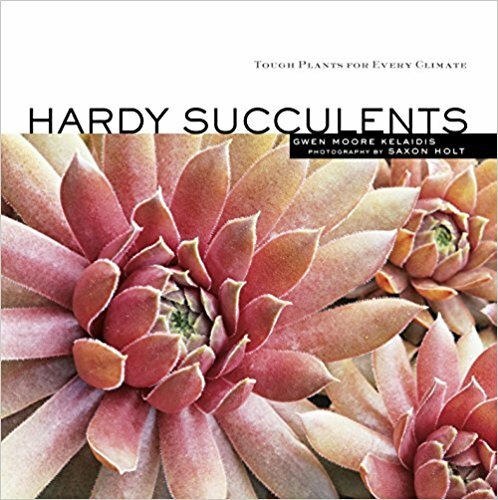 At least several species have succulent leaves, and yet I've never seen them listed as succulents—a category that is quite amorphous anyway. 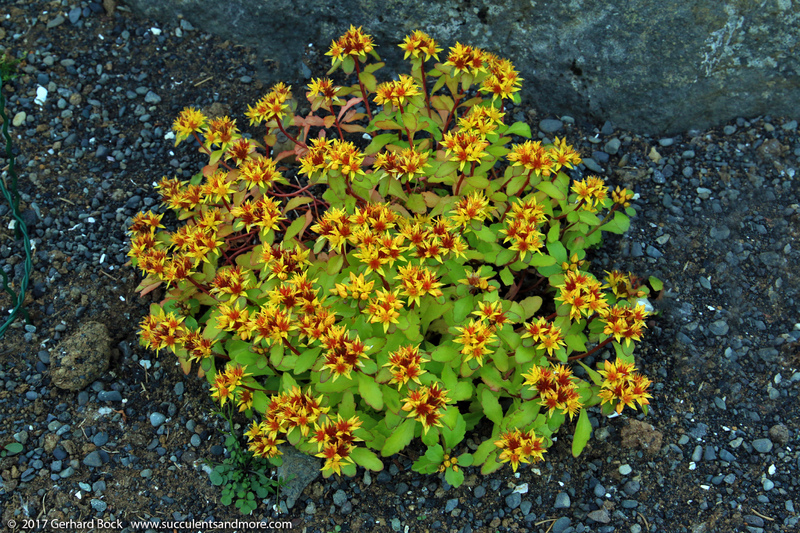 I've come across them in gardens in Portland, OR but they wouldn't stand a chance in hell in our summer climate. According to Plants of Iceland, three sedum species are native to Iceland: Sedum annuum, Sedum acre and Sedum villosum. 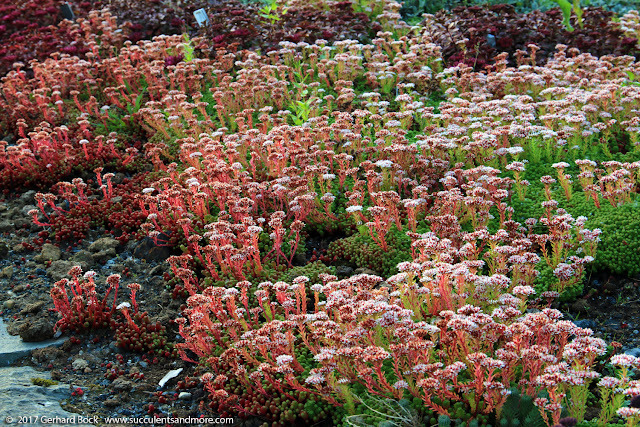 Sedum acre (or goldmoss stonecrop) is a common nursery plant hardy to zone 3. That means it will survive even in places like Minnesota! Another hardy sedum is Sedum spathulifolium, or broadleaf stonecrop (zone 5-9). It's native a wide swath of western North America, from British Columbia to Southern California. Earlier this year we found it growing on rock outcroppings high above the Pacific Ocean on Vancouver Island, British Columbia. 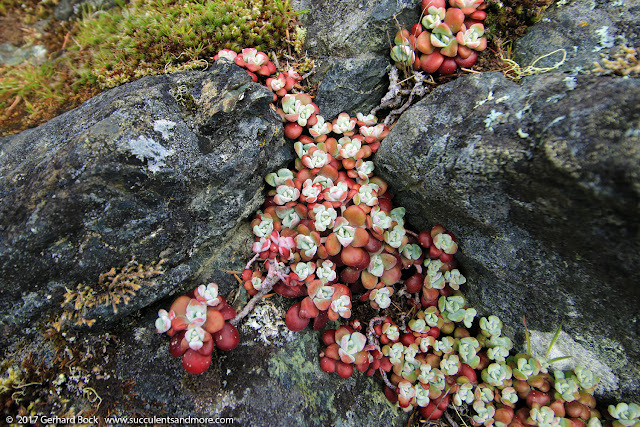 I still find it exciting to encounter a succulent in its native environment! 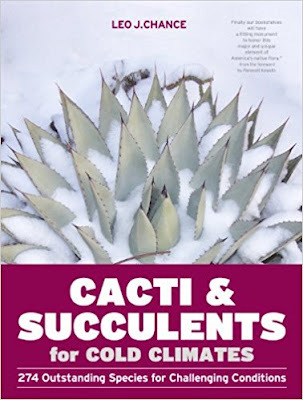 This presentation on the website of the Cactus and Succulent Society of New Mexico has a detailed list of hardy sedums for the Albuquerque area (zone 7b). 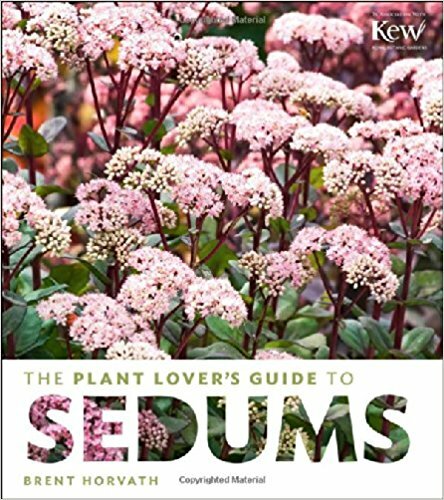 If you want to dive deeper into the genus, The Plant Lover's Guide to Sedums by Brent Horvath (Timber Press, 2014) should tell you everything you ever wanted to know (and more). If you want more information on cold-hardy succulents in general, here are two books I find very useful. I pull them out now and then, not so much because I need advice on hardy succulents (remember I garden in zone 9b) but because they are full of interesting information and beautifully illustrated. 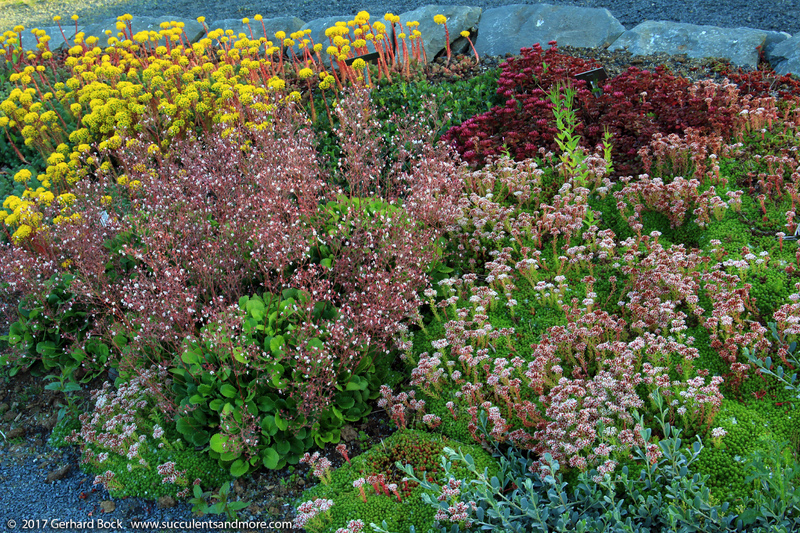 Even though I still don't know exactly what I would plant if I gardened in a climate significantly colder than my own, hardy sedums would be a no-brainer. Great post! 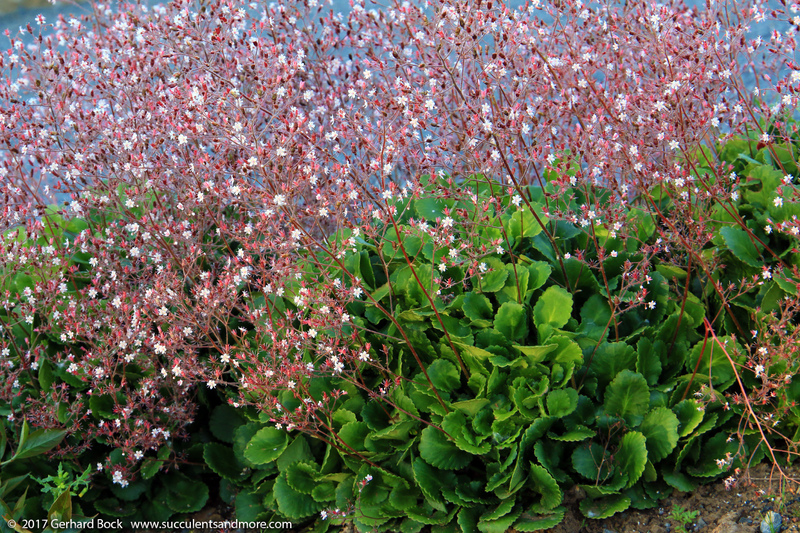 I grow lots of hardy Sedums and Saxifrages here, but I don't think I've ever heard of Sedum lydium. I think I would have gasped too, at that bright red color. Gorgeous! I'd love to find some of that for my garden. Alison, I'm totally infatuated with saxifrages now. But I've learned from my multi-year hosta debacle that some things will never be, no matter how much I want them. Yes, do look for Sedum lydium. It was a revelation for me. A display like that in Iceland would stop anyone in their tracks. I love these little sedums too, and the saxifrages, but you're right, they're not interested in warmer zones. Wonderful post, Gerhard, and Merry Christmas! My question....what is the difference, if any, between Davis and Folsom? Better/worse/same chance of survival? I buy almost every Sedum I see. 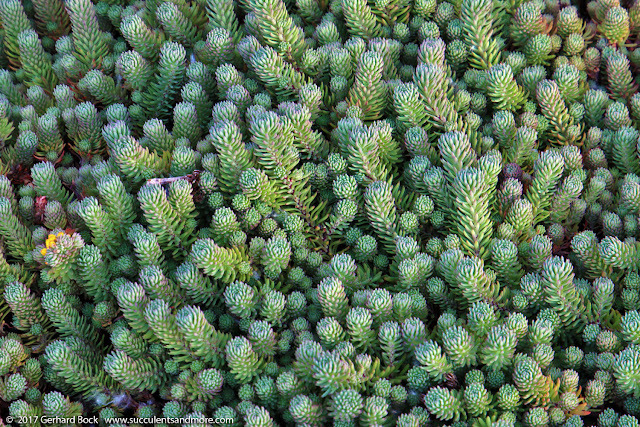 The only one I have right now that is not winter hardy is S.adolphii ...I'm covering it this year to see if I can save it.It's interesting to hear of your lack of success with 'Blue Spruce'--I literally pull handfuls out to keep it from taking over.Next time I see you I'll bring you some-you can have another go with well-established freebies ! Good to point out that not all succulent plants are desert plants!